Details relating to the Lithuanian Commemorative of 2018. 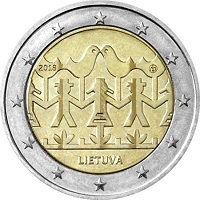 The coin was issued to celebrate the 100th anniversary of the restoration of Lithuanian independence. The main celebration (The Baltic Song Festival) is to take place in Vignis park and a major element of the celebration is to show how dances and songs can serve to unite the nation. In the inner circle are representations of birds and people. The representations are stylized paper cuttings and typical of Lithuanian folk art. The figures show alternatively men and women holding hands in a folk dance. Above the dancers are two dove-like birds who seem to be sharing a kiss. In the extension of the bird motif at ten o’clock is the year of issue “2018” and opposite at three o’clock is the mint mark. From eight to four o’clock runs a line with what appears to be grass sprouting up. Underneath this line is the name of the issuing country “LIETUVA”. From Lithuanian Commemorative 2018 to euro coin collector.